While email marketing is a key communication channel for any non-profit organization, direct mail still remains king when it comes to driving donors to give. Whether it’s envelopes for fundraising materials, event invitations, volunteer release forms, thank you letters or end of year tax receipts, the ability for a non-profit to quickly generate and print out personalized documents is central to its success. Even if the communication is done via email, often times there is need to create and attach PDFs to send along. While a lot of attention is given towards the right mass email platform, who do you turn to when you need to create mail merges from your Salesforce.com data? Conga Composer: Definitely the most familiar name in document creation on the AppExchange, Conga Composer has been in the AppExchange Top 10 for eight years straight. And for good reason too, when it comes to available features and flexibility, Composer is one of the most comprehensive solutions available. Whether you need to generate a single tax letter, or create & email out PDFs of end of year giving summaries to every donor in your organization, Composer can handle it seamlessly. It can handle multiple file formats and works in both PC & Mac environments. It can create and email out documents based on workflow rules for a small fee. Want to automatically email out a PDF of a personalized event invitation to anyone in Chicago who signs up for your newsletter or donates online? No problem. While Composer is one of the most powerful mail merge products, it comes with a somewhat heftier price tag. With a 33% discount to non-profits bringing the per user cost down to $120 per year, a five-user minimum subscription comes to $600 a year. Recent enhancements to the Composer Template Builder and a brand new Solution Manager utility have made it easier than ever for administrators to get started. If you’re an organization with lots of users creating large mail merges on a regular basis, Conga Composer stands out as the best option. Drawloop LOOPlus (Business Edition): The other option when your organization needs the full set of mass mail capabilities, Drawloop’s LOOPlus is able to match Conga Composer feature to feature. It’s got a couple extra tricks up its sleeve, such as automatically creating new records (not just tasks) in Salesforce after completing a mail merge or pushing newly created documents onto an FTP server or Box.net account. Also, when it came to creating new templates, I found it to be more user friendly than Composer. Interestingly, choosing records for mass merges is done in list views rather than through reports (Note that LOOPlus allows you to define multiple cross-object relationships, so there’s no real loss in functionality versus using reports). While this may lead to some duplication of reports, it allows for more granular control of who to include in the merge. Drawloop’s pricing model is both a strength as well as a weakness. While the annual per user cost is a bit higher at $140, Drawloop will waive the minimum user requirement of five down to one for nonprofits. This keeps the minimum annual cost down $140. Unfortunately, there is an additional fee when using the mass merge features of $0.20 per DDP created (DDP, or Dynamic Document Packages, Drawloop’s esoteric term for documents). If you’re creating a lot of mass merges, this can add up quickly and negate any savings made on user licenses. If your organization needs a competitive mail merge solution for only one or two Salesforce users and won’t be creating large amounts of mass merges on a regular basis, Drawloop’s LOOPlus will be a perfect fit. Me2 Systems’ S-Docs Unlimited: For some organizations, especially those that are using mail houses to handle their large-scale direct mailing campaigns, the only real need is for a dependable point merge (one document at a time) solution. S-Docs is able to handle all the different file types and OS environments as well as the rest, while doing so at an affordable price ($72 a year per user with no minimum user requirements). Besides being a point-merge only solution, one major difference between S-Docs and the rest is that instead of creating the document templates as a word or excel file, a WYSIWYG editor is provided within the Salesforce application. This allows a quick and easy way for end users to create new templates, but can make things more complicated for advanced users, especially those comfortable in an MS Office environment. Apsona Email and Document Merge: We’ve previously reviewed Apsona for Salesforce, a powerful data management add-on that plays well with non-profit editions of Salesforce. Unlike the other applications in this article, Email and Document Merge is an add-on feature for the Apsona suite, instead of a stand-alone application. Recently released, the Email and Document Merge add-on is able to handle both one-off and mass mail merges and email these personalized documents to multiple contacts. As Apsona for Salesforce offers license donations to nonprofits, organizations only have to pay for the Email and Document Merge add-on, which is only $65 per user a year. 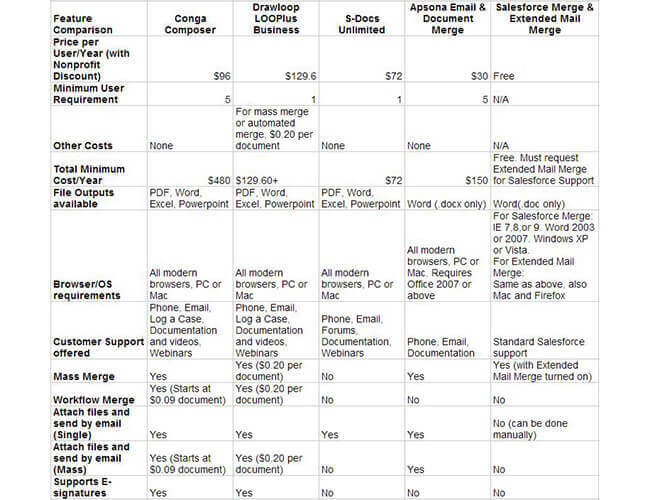 Which is $195 for 3 users annually, $60 for each additional user, and Apsona’s merge tool includes point merge as well as mass email for one price. If your organization is already using Apsona, or if it does not need more file output options than MS Word, the Apsona Email and Document Merge add-on is a rather affordable solution. Salesforce Mail Merge & Extended Mail Merge: Although not as robust as any of the apps mentioned here, Salesforce.com does come included with its own free mail merge features. Word documents are created with merge fields provided by Salesforce, then uploaded into the mail merge template folder. Data available for merging is limited to the primary object and any parent records directly related to it. For the standard Mail Merge (single files only), files must be in the older .doc format and requires IE 7,8 or 9. Only Windows XP and Vista are supported. In order to create mass mail merges, you can log a case with Salesforce support and request that they turn on the Extended Mail Merge function, which also provides additional support for Firefox and Mac OS. While not the most effective solution, the out-of-the-box Salesforce features costs nothing and will work for organizations with minimal mail merge needs. Total Minimum Cost/Year $600 $140 $72 $195 Free. Must request Extended Mail Merge for Salesforce Support. Browser/OS Requirements All modern browsers, PC or Mac. All modern browsers, PC or Mac. All modern browsers, PC or Mac. All modern browsers, PC or Mac. Requires Office 2007 or above. For Salesforce Merge: IE 7,8, or 9. Word 2003 or 2007. Windows XP or Vista. For Extended Mail Merge: Same as above, also Mac and Firefox. Customer Support Offered Phone, email, log a case, documentation, videos, webinars, and online training. Phone, email, log a case, documentation, videos and webinars. Phone, email, documentation, and webinars. Phone, email, documentation. Standard Salesforce support. Click here for a printable table. This is a really helpful breakdown for some problems I’ve been trying to solve! Thanks for putting this together. Thank you, Tal. This is very helpful. Hi Manuel, can you share some information about your integration with salesforce? sorry for the late reply. I was on leave for a while. legodo PowerDocs can be integrated via Salesforce Canvas (compelety running into Salesforce) as well as a simple button which opens a new browser tab or window (for fullscreen PowerDocs). A few weeks ago we were invited in Berlin to show our solution at the Salesforce Innovation Challenge as one of the top 25 applications. Has anyone found a way to automatically deliver rich content to specified (or formulaeic) destinations on Google Drive? We are trying to use workflow events to trigger SalesForce to output files directly to Google Drive, say for example in a client’s folder. Submit a form –> Form creates new data in SalesForce –> New SalesForce data triggers event to create new file –> File is placed in certain path of Google Drive. Anyone know a service or product to accomplish this? Thank you in advance! PS. zAPIer will only generate plain text documents and will not put them in subfolders. Hey Michael – bit of a late response here, but the upcoming release of Conga Composer (currently in beta) has a direct integration with Google Drive. You can create Word, Excel, PPTX or PDF documents to be stored in a particular folder in Drive, or convert a Word, Excel or PPTX template to its correspondent Google Docs format. Composer can even dynamically create folder directories (for example, create a new folder based on Account Name and store your doc there). Pretty awesome! Feel free to give our team a buzz with any questions about how it works. Good article. Useful for my research. Thanks! My business requirement is to automatically send an email with a generated PDF attached to it, to a specific email address, when an Order is approved in Salesforce. What I cant figure out is if, as an administrator, I can use these document generation tools on their own to do what I need, or if I need some custom Salesforce development to generate the email with PDF attached. Chris, Apsona Mail merge has this option built in or you can use Conga Conductor. We are in the evaluating process for a doc vendors and just had a demo from the big 3 – conga, loop and sdocs. A lot has changed since this was posted -Congas pricing has changed and in our demo with sdocs, they showed us mass create, workflow, integration with docusign (e-signature) and google drive (all unchecked in your grid). Loop’s also has a DDP feature that may be valuable to some orgs and worth checking out. Anyhow, my suggestion is to reach out to the vendor to get the latest info as this stuff changes with each release. Dan, the information has been updated. Thanks again for letting us know. Would be nice to add Vertical Response tool for comparison. Vertical Response was not mentioned because it is not a mail merge application it is an Email Service Provider.